There is such a wonderful variety of vegetables and fruits available in summer! To take advantage of nature’s bounty, in Star’s Summer Salad Series, I will share fresh summer salad recipes that are a healthy & a easy replacement to heavy meals. I have some ideas where you don’t have to do much work or compromise on taste and most of these ingredients are handy in your kitchen. Have a go at them and let me know your thoughts and share your favorite recipes in the comments! 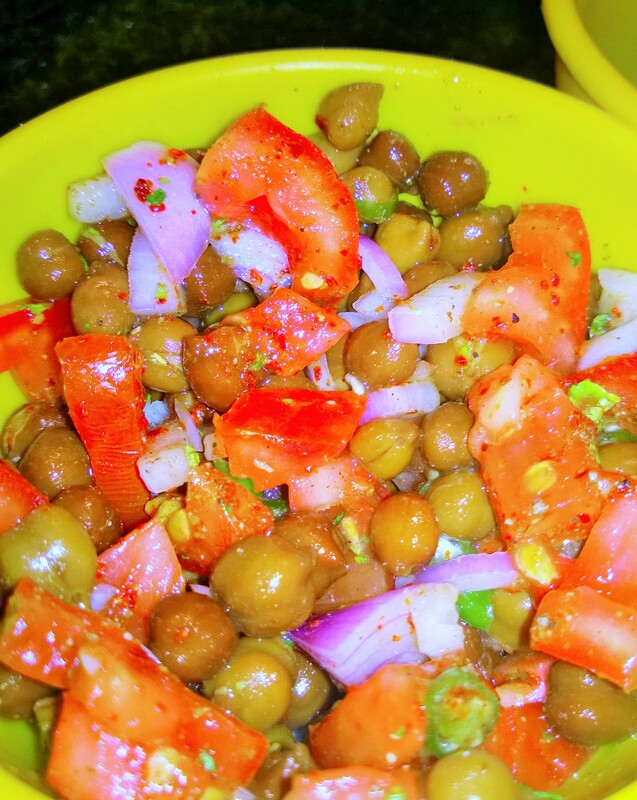 The salad that I am sharing with you as my first recipe, makes me so nostalgic, as a child i used to buy this tasty snack from a vendor who used to stand outside the playground and serve it in newspaper boats. I always asked for extra chaat masala and nimbu, loved the spicy-tangy flavor which makes my mouth water even as I think of it. I hope you enjoy it as much I love it! Mix the veggies with the chickpeas in a large bowl. Add chillies, chaat masala, lemon juice, pepper and toss. Add salt just before serving as it extracts water out of the veggies and makes the salad soggy if added in advance. Garnish with coriander and mint. Serve! P.S. – You could also add boiled, cubed potatoes for an extra textural element! This entry was posted in food, fresh, Quick, summer and tagged Food, fresh, Lifestyle, StarsSummerSaladSeries, Summer. Bookmark the permalink. ← 3 Unique coolers for hot summers! Korean Skin Care Review : Benton Snail Bee High Content Essence! Hot Hot Baby! 3 Ways to stay COOL this Summer! Korean skin care & how I have been living under a rock!! !